Jüri Ratas, Mart Helme and Helir-Valdor Seeder. While the councils of the Center Party, Conservative People’s Party (EKRE) and Isamaa could not approve the coalition agreement when meeting on Saturday as talks have not yet been concluded, the important thing was to have the councils confirm that no one is wavering, that the votes will hold and that the three-way coalition will become reality. When Center took over the government in 2016, party councils were immediately asked to review and approve the coalition agreement, division of administrative areas and ministerial candidates. This time, the latter tasks await the councils next Saturday. EKRE and Center had the most to prove to their partners. Utterances by EKRE politicians that have forced centrists to apologize in recent weeks created suspicions as to EKRE looking for ways of having themselves thrown out of talks. The conservative party’s council decided to support a joint declaration by the three parties, confirming their willingness to rule together. This gave Center and Isamaa more confidence in terms of EKRE not jumping ship at the last minute. EKRE also needed to prepare its members for things that will not happen, even though the conservatives are going to the government. For example, the coalition agreement will not include the revocation of the registered partnership act that was one of EKRE’s core election promises. Leading EKRE politicians said the alternative would suit both the national conservatives and their partners. Mart and Martin Helme shed light on the plan on TRE Radio yesterday. The EKRE politicians said the sides have agreed to introduce a system where collecting 50,000 signatures would allow any public matter to be put up for referendum. “Proposals would automatically enter into force if over half of the electorate turns out in support,” Martin Helme said in terms of how the registered partnership act could be repealed. Creating this procedure would require a constitutional amendment for which the coalition lacks seats. The Helmes said they will try to achieve it through two compositions of the Riigikogu as it requires fewer votes. In summary, the registered partnership act will not be repealed by the incoming Riigikogu. Center needed to demonstrate to its partners that chairman Jüri Ratas is in control of his party, that opponents of the coalition do not have the majority in Center and that votes necessary for the coalition will hold in the Riigikogu. Information available to Postimees suggests that Center’s council meeting did not take long as participants didn’t even take recesses. It only took fifteen minutes for the declaration to be approved after Ratas gave his speech, with only six members voting against it. This does not mean all centrists are happy to form a coalition with Isamaa and EKRE, and many believe that deciding to form the government before they have seen the coalition agreement is like buying a pig in a poke. However, voting is public during council meetings, and those who did not wish for such attention simply failed to show up. It is clear that the coalition agreement will be vague, especially in areas where the partners have fundamental differences. This was suggested by Ratas in his speech when he urged members of the party to evaluate the agreement once it is finished. 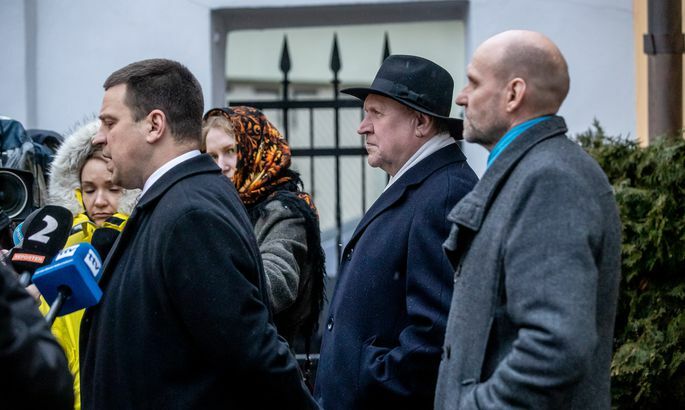 “I will not appear in front of this council with an agreement that clashes with the Center Party’s worldview or Estonia’s interests,” Ratas told doubters. Deliberations took far longer at Isamaa council meeting. Members spent well over an hour discussing the incoming coalition agreement, and critical questions were asked. There are several reasons the public has not heard much about what the parties have agreed on and why the agreement doesn’t have signatures yet. One is time: the longer the public has to delve deep into the contents of the agreements, the more opportunities opponents have for criticism and the likelier that some members of the partners might also waver. Therefore, it is better if the agreement is finished immediately before MPs choose the new Board of the Riigikogu on Thursday. The recent plan of electing EKRE member Henn Põlluaas as the new Riigikogu chairman and Enn Eesmaa (Center) as vice chairman is holding. The position of second deputy chairman traditionally belongs to the opposition leader. The second reason why there is no coalition agreement today is that not everything has been agreed yet. One of the more important items that remains undecided is Isamaa’s promise of making the second pillar of pension voluntary. Postimees has been told that the sides are considering an option where every citizen must join the pillar upon becoming an adult but can decided to opt out and withdraw the money at a later date. Those who have already joined the system will also be able to withdraw that part of pension in full. Therefore – it is necessary to join first in order to opt out. Matters should become clear by Wednesday, which is also when the division of ministries and the names of future ministers should be made public. It is likely that ministerial positions will be distributed following the same logic employed in 2016. Because the prime minister’s seat is locked down, the next choice will fall to the second biggest partner – EKRE. Next, Isamaa gets to choose a ministry. From there, it is once more Center’s turn, followed by EKRE and then Isamaa etc. The question remains whether EKRE will be allowed to pick ministries at will or whether some portfolios will be off limits to them. It is likely the national conservatives want one of three key ministries that need to sign for any bill that passes through the government – the finance, interior and justice ministries.